Recognised anti-fungal, ant-hypertension and anti-hyperlipidaemia effects. For centuries, garlic has been valued for its many health benefits. Modern research has confirmed its immuno-stimulant properties (it increases the number of Natural Killer Cells, a key element of the immune system), its antioxidant properties (it raises glutathione levels) as well as its inhibitory effect on platelet aggregation and its effectiveness as a chelator of heavy metals. The Japanese company Wakanuga has been making Kyolic for more than 40 years. The production process is protected by 12 international patents. Over 360 scientific studies have been published, validating its health benefits (available at www.kyolic.com ). Kyolic is without doubt the best garlic supplement in the world: it is organically grown in a compost-rich soil, harvested at full maturity, then aged at ambient temperatures for 20 months. This process enables irritating, odorous compounds to be converted into antioxidants including the potent S-allyl cysteine, a water-soluble, sulphur-containing component, of which Kyolic provides a standardised dose. Kyolic production methods are in accordance with ISO 9002 standards and have been subjected to over 250 separate quality control checks. 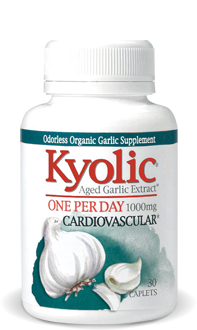 Kyolic One per Day is the most potent garlic extract available in a single tablet and provides the amount of garlic shown to be beneficial without having to take multiple doses. Kyolic is guaranteed odourless: it's the only garlic supplement that's truly odour-free due to its exclusive ageing process which completely eliminates odour. Kyolic One per Day helps maintain healthy circulation and normal cholesterol levels and reduces homocysteine levels (an important cardiovascular risk factor). Other ingredients: microcrystalline cellulose, hydroxypropyl cellulose, silicic acid, magnesium stearate. Take one tablet a day with food, or as advised by your therapist.